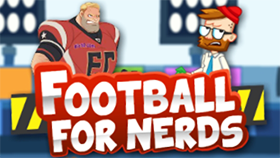 Pro Football is an interesting sport game (American football) developed by Mike Jewell and his team. In Pro Football, you control a football player. Your task is to score as many points as you can and win all matches. 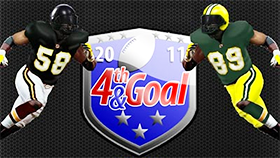 With great gameplay and classic graphics, I believe you will enjoy playing Pro Football. In each match, you will play in two different positions, Running and Kicking. In Running, you are on offence. Your mission is to dodge the defenders of your opponent, grab the ball and run to the finish zone as quickly as you can. Remember: When you run and score a touchdown score, you will have extra points with kicking the goal. In Kicking, your task is to kick the foot-ball to the center of the goal. You can customize the direction and the power of your kick, and you also can set the accuracy. You have to pay attention to the wind direction because it will directly affect your shot. Note: If you miss the goal, you lose a foot-ball (you have 4 foot-balls). Interest in Pro Football is that you can collect power-ups in the map for bonuses, such as speed boost and extra ball. Good luck and have fun! Use Z to dodge tackles (Running). Use Z to set the direction, power and the accuracy (Kicking). You can play Pro Football in full screen mode. Use Z to dodge tackles when your Dodge Meter is full. Score as many touchdowns as you can. You get more points the further you run. Kick the ball towards the center of the goal for maximum points. If you want to play Pro Football Unblocked, you can visit FreeGames66.com, the site for hundreds of unblocked games. Here, you can experience your games smoothly. Besides, you can also play hundreds of unblocked games, all for free. Now, enter Pro Football Unblocked, run through the defenders of your opponent and score as many points as you can. Play now!